Abs exercises - the truth! Are you eating California’s dead pets? Welcome to this week’s Femail page - with most of us still in shock at the still unfolding tragedy in Burma and the appalling manner in which it is being handled by the ruling Junta. The winds in our neck of the Chiang Mai woods were stronger than anything we have previously experienced, what it must have been like in the Irrawaddy delta and in the other seriously affected areas, we just cannot imagine. Our hearts go out to all those desperate people, in the hope that the military regime which has wrecked so many lives for so many years will, in this desperate situation, remember that they, too are human beings, and let in the aid and the experts who can deal with the tragedy. There doesn’t seem much else to say right now, except to wonder why no public protests against the junta’s callous behaviour seem to have yet been organised in this city, with its tens of thousands of Burmese students and workers. In the summer, when the riots in Burma were a major news story, peaceful demonstrations were held at the Three Kings’ Monument in support of the Burmese people. Perhaps this is the time to join together again; although we can offer little in terms of practical assistance, we can at least show support, sympathy, solidarity and love to those who have lost everything. 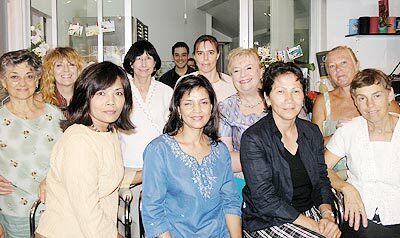 The recent monthly meeting of the Chiang Mai Expat Ladies’ Lunch Group - this time at Chez Marco’s, all smiles, including Marco in the background! The by now infamous, (sorry, girls, only joking), Chiang Mai Expat Ladies’ Lunch Group met again last week, this time at Chez Marco’s, the last minute worthy replacement for The Elizabethan Room, which was unexpectedly closed due to acute illness of an unmentionable type contracted on a trip up-country - we all hope that everyone’s recovered by now. Rather fewer of us than normal were able to attend; as a result, rather than arranging a pre-agreed menu at short notice, it was decided that it would be kinder to Marco to just order from the lunchtime list. Some of the ladies arrived during a burst of heavy rain, which didn’t dampen the atmosphere inside the restaurant at all! The food, as usual at this well-known venue, was excellent and good value, and the conversation was non-stop, also as usual. Next month, due to present organiser Sally’s UK trip, there will be no formal meeting, but if anyone wishes to meet up at Chez Marco’s, they will be more then welcome. Thanks go to Marco and his staff from everyone present for the last minute arrangements. First, the bad news; all those sit-ups you keep trying to do, and all those gadgets with wheels or frames and special “rocking” movements - forget them! You’ve wasted your money and your effort. Yes, you were exercising your muscles, but not your abdominal muscles, and also you were at risk of straining your back! Now, the good news; there is a way to exercise your abdominals which, if correctly executed, will cause no strain to your back, and you don’t have to buy any more equipment to do it! The principle is as follows - the only way to exercise your abs correctly is to shorten the distance between your sternum and your pubic bone. Put simply, you contract your abdominal muscles, thereby bringing both parts of your skeleton closer together. A small, concentrated contraction done correctly will be enough. In case you weren’t sure, your abs are a series of 8 linked muscles, attached both to the sternum and the pubic bone, the upper 6 above the waist and the lower 2 below. They are not particularly strong, but are an important as part of the group of muscles around the midriff which combine to give you core strength and correct posture. When you accumulate excess fat around the stomach area your lower back is placed under strain and begins to bow - not a good sign. Consequently, the abs are used less because your posture is unbalanced. This is how you correct the problem. Lie on your back on a flat, hard surface - a tiled floor is good - hands by your side, and legs stretched flat but relaxed. Slide one hand under the arch of your lower back. Relax and breathe in and out twice. Whilst breathing out, push the small of your back towards the floor, removing your hand when you are comfortable with the feeling. Let your knees and head come up as you push down. Hold the position, with your spine flat against the floor, and then relax. Repeat the exercise 8-10 times, slowly and carefully. This simple routine is the building block for all abdominal exercise, whether aimed at the upper or lower group of muscles. Admittedly, it takes a while to condition the abdominals, but the benefits to your entire exercise regime, not to mention your shape, are enormous. And, to any men who may be reading this, over a period of time abdominal exercises do wonders for your six-pack! Next week, more on abs exercises and core strength. A recent report states that for many years all of the dead animals in California have been added to the feed of chicken, fish, beef, shrimp, etc., which we humans eat every day. Virtually all of the animals killed in shelters and veterinary clinics, road kill, medical laboratories, feed lots, deceased wildlife, etc., are sent to one company, West Coast Rendering in Vernon, CA, where they are piled up and left to decompose for days before being “rendered” into a saleable product. Los Angeles County has contracted to provide its dead animals to the same rendering plant for decades. Four years ago, when Grillo informed the Los Angeles County Board of Supervisors of where their own Los Angeles County Animal Control’s dead animals were going, supervisors were divided. Some said that they didn’t know about it, but did nothing; others said that the practice was perfectly legal.